With Amazon announcing a new entry-level Kindle that’s getting released in April, let’s take a look at the differences between it and the new Kindle Paperwhite that was released four months ago. I’ll post a hands-on comparison with a video review showing the differences between the two latest Kindles after the new one gets released, but for now let’s just outline all the main differences on paper. At first it was hard to see the value of this new Kindle at $89 when the Paperwhite often goes on sale for under $100, but after thinking about it more most people that buy a Kindle are just looking for something inexpensive to read ebooks on. Having a “waterproof” Kindle is unimportant to most people, especially since it’s not meant to be used in water anyway—it’s just meant to be added protection for accidental spills and drops and such. Additionally, most people don’t care about having 8GB of storage space when the 4GB on the entry-level Kindle is enough to hold “thousands” of ebooks. What percentage of people even have thousands of ebooks? Then what percentage of those insist on having all their ebooks downloaded to a single device at all times? 4GB of space is still plenty for an ebook reader if all you do is read ebooks and not a lot of large comics, manga, PDFs, etc. To some people the low resolution 167 ppi screen on the new Kindle is a deal-breaker, but the entry-level model is geared more toward new buyers, and if you go back and look at the reviews of the previous entry-level model there are by far and away a lot more complaints about it not having a frontlight than the screen resolution being too low. Although not ideal, 167 ppi is still perfectly adequate when it comes to reading ebooks. We won’t know until the new Kindle gets released, but it will almost certainly have all the exact same software features as the Kindle Paperwhite. For the most part, Amazon’s Kindles run the same software dating all the way back to the Kindle Paperwhite 2 that was released in 2013. 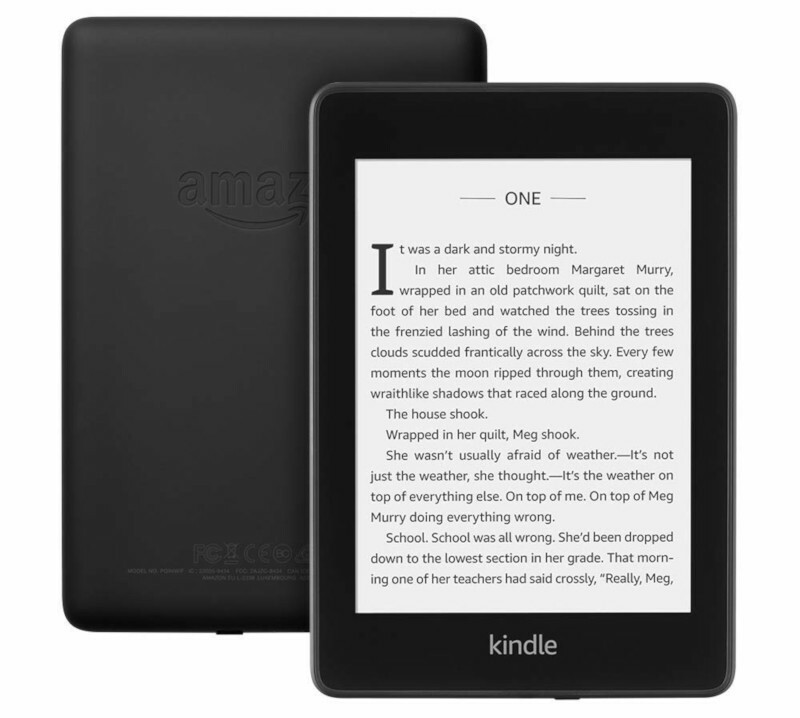 There are a few minor differences with the newer models, like the ability to read with white text on a black background, but the new Kindle will most likely have that feature as well. Update: It turns out the new 2019 Kindle does not have the option to use inverted mode like the Kindle Paperwhite and Oasis. It also lacks the option to turn off the touchscreen. So paying more for the Paperwhite mostly comes down to the hardware differences. The main difference between the two models is the screen. Both have 6-inch E Ink screens but there’s a big difference in the screen resolution. Higher resolution equates to sharper and darker text. However, Kindles with lower resolution screens usually have bolder text to compensate so the difference can be harder to notice because the bolder text helps make it look darker than the thinner text used on the Paperwhite. This is something that needs to be seen in person to properly judge (or at least in a good-quality video, which I’ll upload after release). It also greatly depends on the font size that you use; smaller font sizes benefit more from higher resolution screens than larger text. Another difference between the screens is the Paperwhite has a flush front screen with a plastic layer over the E Ink, whereas the new Kindle has an indented screen. Both have capacitive touchscreens and frontlights, except the new Kindle has 4 LEDs and the Paperwhite has 5 LEDs. Amazon doesn’t state the battery size for their Kindles so we won’t know until someone takes the new Kindle apart, but just going off of Amazon’s estimated battery life claims the Kindle Paperwhite’s battery will last 50% longer. They say the new Kindle’s battery will last up to 4 weeks per charge based on reading for 30 minutes every day, and the Kindle Paperwhite has a 6 week estimate based on the same conditions. The Kindle Paperwhite is IPX8 rated, meaning it can withstand being submerged in up to 2 meters of water for 60 minutes. It cannot be used underwater. The new Kindle is not waterproof. The new Kindle comes with 4GB of storage space and the Kindle Paperwhite comes with 8GB with the option for 32GB. The Kindle Paperwhite has the option to add cellular wireless to download ebooks even when you don’t have access to Wi-Fi. The entry-level Kindle is Wi-Fi only. Kindle Paperwhite: 167 x 116 x 8.18 mm; weight: 182 grams (Wi-Fi model), 191 grams (cellular model). Kindle: 160 x 113 x 8.7 mm; weight: 174 grams. The Kindle Paperwhite starts at $129 for the 8GB model with Special Offers (ads) and the new Kindle starts at $89 for the version with Special Offers. That’s not a big difference in price but it’s enough that I think more people will be tempted by the new Kindle when it goes on sale. The new Paperwhite often goes on sale for $99 and once it went it on sale for $89, so if they discount the new Kindle by the same amount that’s going to be a good price for a frontlit ebook reader, low resolution screen or not. Ultimately I think having a frontlight will draw in more new Kindle users than having a higher resolution screen with no light. Yes, sharper text but not necessarily darker. The Kobo Aura H20 (first edition) has lower resolution but darker text than many 300PPI e-readers. In my opinion, the text on both the current Paperwhite and Oasis 2 looks faded. The entry-level Kindle always has always had decent contrast to make up for the lower resolution. It is not only text but also images. The lower resolution means both text and images are out of focus in comparison to higher resolution e-readers. I’m not even sure if the contrast is significantly different between E-Ink Carta and Pearl as E-Ink claim. I’ve used the Tolino Page with Carta but thought the previous generation Kindle Basic text looked better in comparison. Both resolution and black levels are key. The first gen H2O has an infrared touchscreen so it has better contrast than the Paperwhite and the Oasis. Any extra layer over the screen—glass, frontlights, capacitive touchscreens—reduce contrast slightly. That’s why I’m not a big fan of having flush screens on ereaders. I like the super clear text on infrared screens better—that’s how E Ink is supposed to look before they started trying to make ereaders more like phones and tablets. Another issue: I noticed some readers complain about the pricing of the ‘all-new Kindle’. I don’t think it is fair to compare the full retail price of the latest Kindle Basic to the sale price of the Paperwhite. The Paperwhite went up in price and so did the Kindle Basic. The price differential between both devices is the same as previous generations. I still think the Paperwhite is a better choice. Reading without a front light is fine during day time, but it kind of defeats the point of having an ereader at night. Ease of storage and nighttime reading are the main reasons people get Kindles, I think. Still, it’s a good deal for an entry-level device. The new Kindle adds a frontlight so I’m not sure what you mean by this comment. Did you actually read the review? I don’t care about the resolution, but if this new Kindle Basic is still using the Pearl screen (instead of E-Carta) that would be a deal breaker. E-Carta is more important to me than the light. How do you know it’s using Carta now; where can I find this information? They said it uses the latest screen tech in the press release, so that would imply they upgraded to Carta. For books in other languages (like Urdu or Hindu) where many PDFs are typically made from scanned images of the hard copy, and hence the book size is as high as 400 MB in some cases, is Kindle a good choice? Or Would it be slow for such documents? Slow is not the issue, trying to read a scanned PDF on a 6-inch screen is not going to be a pleasant experience.